The on-going mission of the Team Backspindle is to promote and support products published by Backspindle Games. The members of the Team Backspindle are a special group of people who are energetic about games and grow communities of informed and enthusiastic players. Members of the Team Backspindle are expected to create an exciting experience for Backspindle Games products by running demos primarily at conventions, possibly hobby stores, post and report reviews online, hold tournaments, and assist Backspindle Games with play-testing of possible new games. We are looking for people that are excited to help promote Backspindle Games on all fronts, whether it is in the conventions, hobby stores, gaming clubs or online. • Submit a completed Team Backspindle application and recent photograph of themselves. • Have a passion for gaming, hobbying and a strong conviction to build a community around our games. As part of the Team Backspindle, primarily members will be expected to volunteer to demo at gaming conventions alongside Backspindle Games employees and other Team Backspindle members. However, they can also propose to us events that positively promote Backspindle Games, and suggest online content that can spread our positive image in the community. The following are some examples of possible involvement. Along with the above, a Team Backspindle member is representing Backspindle Games. Members will be seen as a reflection of our company. Because of this, we require members to have a certain level of professionalism in which they act in all ventures that would reflect well on themselves and Backspindle Games. It is also very important to respect the venue any event you are involved with takes place. Rules set by the venue must be adhered to at all times, and by both the Team Backspindle member and any players involved with the event. All areas used or litter etc. must be cleaned up at the end of the event. It doesn’t matter how good the event was if the venue won’t let you/Backspindle Games run another one. Team Backspindle members and volunteers can support at conventions where Backspindle Games has a booth and runs events (initially we are targeting within the UK, Europe and Ireland). Along with the expectations that are listed above, Backspindle Games holds our members and volunteers as part of the group and brand that we present. Volunteers must agree to and sign the Backspindle Game Equal Opportunities Policy. Convention schedules and volunteer sign-ups will be emailed to selected applicants. Shifts are assigned as either 3 or 4-hour slots. Day volunteering will cater for breaks of a minimum of at least one hour. (See below for full details). Backspindle Games provides all materials that volunteers will require for their shift during the event. While on the Backspindle Games booth at a convention you can speak to a Backspindle Brigadier for additional questions. Here’s what you get as a Team Backspindle member. • A chance to be part of the story of Backspindle Games and help it to grow. • 1 free game for each half day demoed at a convention. • Lunch (sandwiches/drinks/snacks etc.) will be provided for anyone demoing for a whole day. • Con Entry pass for the day demoed (must be returned at end of day). • A rota will be created and breaks must be agreed with us two weeks prior to the convention. • Added to our playtesting team list. • May receive prototype of new games to test with their gaming groups and at local small cons. • A credit as a member of Team Backspindle in the rules of each new published game that they play-tested. • T shirt – You will be lent a t-shirt if demoing for half/one day or, get to keep a t-shirt with your nickname embroidered on the back if demoing for the duration of a major convention (i.e. 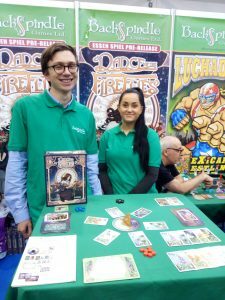 Spiel, Essen; UK Games Expo). • Team Backspindle volunteers will be kept informed at all times via email or mobile phone. ½ Day Demo stints are three or four hours, depending on convention opening hours, either morning or afternoon. • 6 hour day – 5 hours demoing, one hour break. • 7 hour day – 5. 5 hours demoing, one and a half hours break. • 8 hour day – 6 hours demoing, two hours break. • 9 hour day – 7 hours demoing, two hours break. • 3 day convention (2 full days demoing) – breaks as above and a weekend convention pass to use for the rest of the convention. • 4 day convention (3 full days demoing) – breaks as above and a weekend convention pass to use for the rest of the convention.